Successful business recruitment programs provide an effective means to communicate Nebraska’s locational advantages to business and industry and to identify companies which may be expanding or relocating manufacturing facilities. NPPD carries out a program to attract business on behalf of our entire service territory and works in conjunction with our communities, the Nebraska Department of Economic Development, and other allies. NPPD is constantly evaluating different methods of attracting the attention of site selection consultants and business executives. 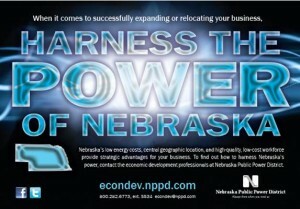 NPPD’s marketing program is designed to create a positive image of our state, develop relationships with decision makers, and to generate interest in locating a project in Nebraska. The first step in an effective business attraction strategy is to identify industry targets that make sense for your community and the state. NPPD’s research team is constantly following trends and researching the best fits for Nebraska. They can walk you through a process to discuss and identify the types of business and industry that you should be pursuing. Targeted industry studies are prepared by NPPD, often in cooperation with the Nebraska Department of Economic Development and the University of Nebraska. These studies define the characteristics of an industry and compare labor and energy costs for a model manufacturing plant. Manufacturing costs in states with significant production in the targeted industry and surrounding states, which compete for industrial location projects, are compared with a Nebraska plant location. Contact us if you are interested in knowing more about industry targeting. NPPD uses advertising placements in economic development and target industry publications to educate companies on the advantages of a Nebraska location, encourage inquiries, build an awareness of Nebraska, and encourage the use of our website. 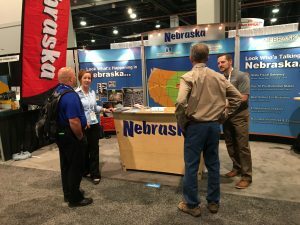 Exhibiting at selected trade shows provides identification of companies with expansion projects, state exposure to the industry, distribution of Nebraska materials, and one-on-one conversations with CEOs and industry executives. NPPD-sponsored trade show events offer our communities the opportunity to participate in out-of-state marketing activities and to leverage their marketing dollars. Often, these activities are co-sponsored with economic development allies such as the Nebraska Department of Economic Development. NPPD Economic Development team are members of various economic development professional groups. They attend corporate site selector conferences and meet with real estate executives to stay abreast of issues and build relationships with decision makers periodically. Such meetings include industry roundtables and forums as well as the Industrial Asset Management Council. These meetings allow team members to update the consultants and executives on Nebraska’s advantages and enhance our relationship with them. NPPD team members are available to work with you to develop and carry out a marketing trip to specific geographic locations. We also partner with Nebraska Department of Economic Development on such trips when possible. Marketing trips have a three-fold purpose – targeted industries, headquarter companies with plants in Nebraska, and site selection consultants. Pre-arranged appointments are often preceded by a direct marketing campaign. We can assist in identifying the list of targeted companies, developing marketing materials, and arranging the appointments. Accompanying you on the marketing trip as well as assisting you with the follow up can be arranged. Whether it be a direct mail piece or an email campaign, we can assist you with the development of your message and materials as well as identifying companies and individuals to target. Some of our best leads come from referrals – adding credence to the old adage, “it’s who you know.” Talk to your businesses about suppliers and customers. If you have generated a lead, contact NPPD’s Economic Development Team for assistance. Your lead will remain confidential and “exclusive” to your community.